Annette is Principal and Director of Risk Edge Pty Ltd, a company she founded in 2010, and has almost 30 years’ experience in the water and environment industries. Annette is a specialist in water cycle risk management, regulation and policy. 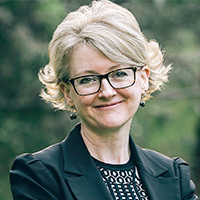 She currently chairs the Animal Ethics Committee for Regeneus (regenerative medicine company) and is on the Strategic Advisory Committee for Water Research Australia. She has completed two terms on the Board of the Australian Water Association and is currently the risk advisor. Annette worked as an industrial microbiologist for Rio Tinto on migrating to Australia. She has since worked in a number of private and government roles including as a Post-Doctoral Fellow at Macquarie University, as Senior Consultant at Australian Water Technologies (Sydney Water) and as Urban Water Risk Assessor at the Department of Land and Water Conservation. Annette has a BSc(Hons) in Applied Biology from John Moores University in Liverpool, UK, and a PhD and Masters in Environmental and Local Government Law, both from Macquarie University. She is also a Graduate of the Australian Institute of Company Directors, has a Certificate IV in Training and Assessment and is a qualified Lead Auditor.